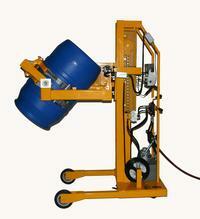 Air Powered Drum Dumpers are built to meet the needs of your specific drum dumping application. We will discuss your project with you in detail to determine the features that fit your application perfectly. Extremely quiet low decibel air motors with shut-off valve and regulator. Darcor Ergonomic Casters: 8" x 2" rigid, 5"x 2" swivel. Includes step-down foot floor locks for added safety. Powder coat finish is standard. Optional FDA approved power coat finish with stainless steel hardware or stainless steel construction. 180 degree forward rotating. strap or clamp rotators or 360 degree side rotating, strap or clamp rotators. Load Capacity varies from 1000 lb/453 kg to 200 lb/90 kg by means of an adjustable leg feature, therefore the longer the leg length, the greater the capacity. Lift Heights to the bottom of the drum in vertical position vary from 48"/1219 mm to 144"/3656 mm depending on your requirements. 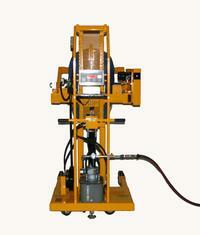 Weight of equipment varies with models and capacities. Dimensions: 34" width x adjustable length according to capacity x height determined by size of single or two stage mast. Made In USA! Please call ZORIN (888) 378-6525 to discuss you application.